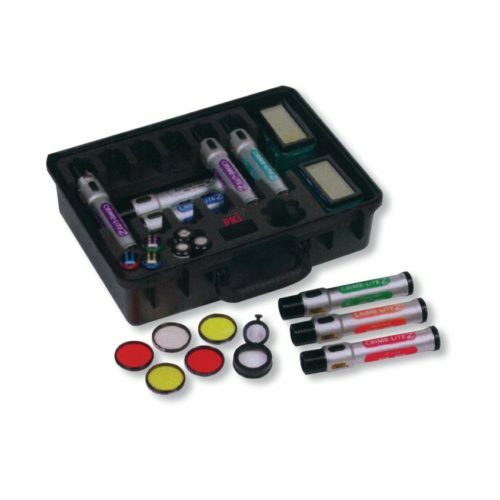 The PKI 9775 set is a composition of different light sources able to support crime scene investigations. The lamps among others produce a strong ultra violet or green light in order to visualize traces and residues for the human eye or cameras. With an extensive selection of glasses, colour filters and lens attachments, even the slightest residues of for example finger prints or body fluids can be tracked and secured. The lamps use energy-saving light sources, such as LEDs or halogen, to the greatest possible extent. Special attachments for reflex cameras facilitate the production of photographic evidence. All tools are arranged in a rugged carrying case and always ready for use.